1　A phoenix. 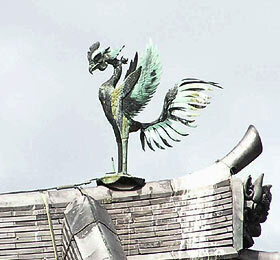 A mythical Chinese bird, thought to have been introduced to Japan in the Asuka period. The phoenix has a bird's beak, a swallow's jaw, and a snake's neck; the front half of its body is thought to resemble a giraffe, the back half a deer. Its back resembles a tortoise, and its tail is like a fish. It is often shown in a paulownia tree (Chinese parasol tree, aogiri 梧桐), with bamboo in the background, or surrounded by Chinese arabesque foliage *karakusamon 唐草文. It became a popular decorative motif in the Nara period, and was used on a wide variety of items including textiles, mirrors, chests, and lacquer ware. Outstanding early examples of the phoenix designs can be seen on the ceiling of Houryuuji *Kondou Nishi-no-ma 法隆寺金堂西の間 (late 7c). Houou depicted on the back of mirrors were popular in the Heian period. 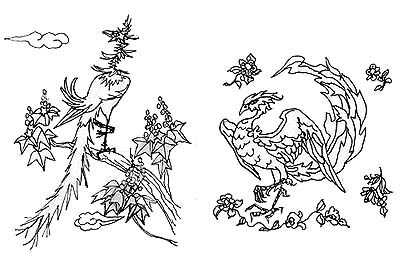 Some of these used a Chinese style, but others Japanized the houou motif, replacing arabesque foliage with Japanese wild grasses, and changing the bird to resemble a blue magpie onagadori 尾長鳥, or a crane tsuru 鶴. A famous pair of houou statues, made of copper and measuring 1 metre in height, can be seen on the roof of Byoudouin *Hououdou 平等院鳳凰堂 (1053), Kyoto. Throughout the 13-19c the houou remained a popular design, particularly on gold and silver lacquered boxes (see *makie 蒔絵) and for *nou 能 costumes. The original Chinese background of paulownia and bamboo was gradually replaced by combinations of peonies, cherry blossoms, crysanthemums, and seasonal Japanese wild flowers. The phoenix appears on three crests, known as hououmaru 鳳凰円 (phoenix circle), tachihouou 立ち鳳凰 (standing phoenix), and tobihouou 飛び鳳凰 (flying phoenix). Imperial buildings, and Buddhist temples. The phoenix myth dates at least to the Shang dynasty, and several early texts describe it perched in paulownia (Jp: kiri 桐) trees and eating bamboo leaves. Like the mythical *kirin 麒麟, the phoenix is a composite of several different creatures including the pheasant and peacock and also embodies both a male element, the hou 鳳, and a female element, the ou 凰. Its plumage is said to be five colored. The phoenix was a symbol of longevity and good fortune,appearing during times of prosperity and signaling the advent of good government. In later Taoist legends the phoenix was a vehicle of immortals that transports them to the Western Paradise. The earliest depictions of the phoenix are found on walls of ancient Chinese and Korean tombs and in textile fragments. By the Ming dynasty (14c) the phoenix had achieved wide popularity, as seen in the painting by Lin Liang (Jp: Rin Ryou 林良: early 16c) at Shoukokuji 相国寺 in Kyoto. In Japan, the phoenix was a favorite design motif in textiles, metal work, ceramics and architecture. It appeared as early as Kofun period metal work and on numerous *Shousouin 正倉院 craft pieces. Polychrome wooden phoenixes are found in the canopies of Houryuuji *Kondou 法隆寺金堂, in Nara. Byoudouin *Hououdou 平等院鳳凰堂 (1053) in Kyoto, is shaped like the bird in flight and topped with bronze phoenixes, perhaps a reference to the birds ability to carry one to the Western Paradise. Paintings of phoenixes roosting on paulownia tree were a speciality of *Kanouha 狩野派 artists, but in this case they were emblematic of benevolent rule of the Tokugawa 徳川 family, whose crest was the paulownia. The phoenix crest or hououmon 鳳凰文 appeared in the Heian and Kamakura periods. For example, the circular crest of the phoenix, paulownia, and bamboo was reserved for the emperor's ceremonial outer cape.